For a complete list of calendar of events, click here. There are more than 100 Antique stores throughout Sussex County. Maps and brochures can be picked up at the Rehoboth Beach-Dewey Beach Chamber of Commerce Visitors Center, located at 501 Rehoboth Avenue in downtown Rehoboth Beach. There are many unique art galleries and studios located throughout the resort area. Browse them for that one-of-a-kind piece of artwork or gift. Area attractions include: Mile Long Boardwalk in Rehoboth Beach, Water & Nature Cruises, Parks, Dolphin and Whale Watching (Fisherman's Wharf), Ferry Ride & Crossing (Cape May-Lewes Ferry), Shuttle Tours (Jolly Trolley of Rehoboth Beach). Concerts and other musical events are held during the summer season at the Bandstand on Rehoboth Avenue. For schedule of events & infomation, call 302-644-2288. Check local newspapers for notices of special events. There are many opportunities for cycling in Rehoboth Beach, Dewey Beach and the surrounding area. Bicycles can be rented for the family to enjoy a pleasant outing. Riding on the Rehoboth Boardwalk can be done from May 15 to September 15 between 5:00 AM and 10:00 AM only. For additional information call 302-227-6181 or 302-227-2233. The Junction and Breakwater Trail is a crushed stone trail that runs between Kings Highway/Gills Neck Road in Lewes to Hebron Road in Rehoboth Beach and is a 5.2-mile one-way trail that is flat and easy. Parking access is either from the Wolfe Neck Road lot or the parking lot behind the Seaside Tanger Outlet. For more information, visit www.destateparks.com. The Gordon's Pond Trail connects to the Junction and Breakwater Trail. The Bicycle Trail in Cape Henlopen State Park is a 3.5 mile paved loop trail through the park. The loop offers various branches that lead off into the marshes with wide vistas of the Atlantic Ocean and the opportunity to explore the "walking dunes". The trail passes thru Fort Miles, open year round for special events and tours, to see guns and fire control towers from WW II. Also visit www.bikeatthebeach.com for a biking map by DELDOT. Click here to view the Rehoboth Beach Bicycle Friendly Street Guide. Back road Bicycling and Auto Tours: The Southern Delaware Heritage Trail connects rivers, scenic drives, local heritage and historic sites, country inns, bed and breakfasts, motels and antiquing. The loop trail is marked by signs which connect several historic towns west of Delaware's beach resorts. The trail route provides 130 miles of connecting trails for cyclists and more than 70 miles of scenic country roads for motorists who like to venture off the beaten path. Noted birdwatching sites include: Abbott's Mill Nature Center in Milford, Assawoman Wildlife Refuge in Frankford, Cape Henlopen State Park in Lewes, Cape Henlopen State Park-Gordon's Pond in Rehoboth Beach, Cape May-Lewes Ferry, Delaware Seashore State Park in Rehoboth Beach, Prime Hook National Wildlife Refuge in Milton, and Trap Pond State Park in Laurel. Voted Top 10 Boardwalks in 2007 & 2009 by Sherman's Travel and by National Geographic in 2011. The Rehoboth Beach Boardwalk is one mile of eateries, games, shops and hotels. Vehicles, skateboards, roller skates and inline skates prohibited. Bikes allowed only 5:00 A.M. to 10:00 A.M., May 15 through September 15. Dogs allowed only October 1 through April 30. Sleeping and changing of clothes prohibited. All motorboats launched from tidal access areas administered by the Division of Fish and Wildlife must be registered in Delaware. Ramp certificates cost $35 and must be purchased from the Division of Fish and Wildlife at 302-739-9916. 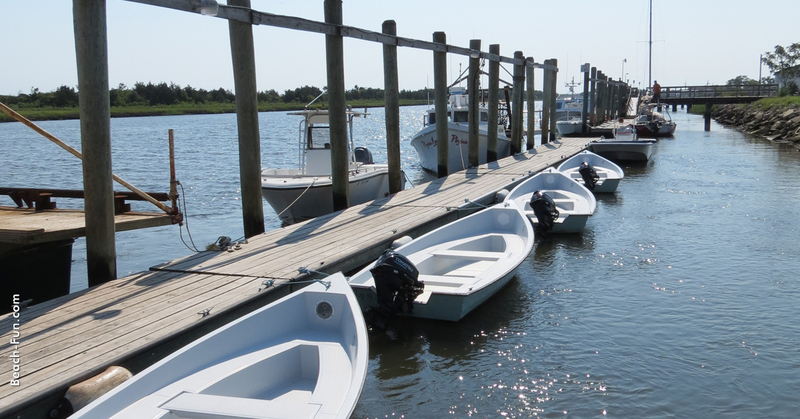 The Rehoboth and Delaware Bays offer excellent conditions for small boating, sailing and water skiing. Boating and water skiing information can be obtained from any of our marinas. Sailboat rentals are available in many areas in Dewey Beach and in Lewes. Don't forget ocean kayaking. Check out FREE Wednesday Night Bonfires on Dewey Beach! Click here for dates and times. Check out the Chamber's Calendar of Events page for events happening in the resort area. Check back often...the list is updated on a regular basis. Naturalist-led canoe outings are regularly offered through several of the state parks. More than seven miles of canoe trails run through the Prime Hook National Wildlife Refuge. Ocean and Marsh Kayaking is also popular in Dewey Beach on the bay or ocean. Clams and crabs can be found in special locations around Rehoboth Bay and Love Creek. It is best to check with the bait and tackle stores for the right bait and equipment. For information about proper locations and prohibited shellfish areas, contact the Delaware Natural Resources & Environmental Control Enforcement Section at 302-735-2960. During late July through early October. Dolphins can often be spotted just off-shore along the coast. A variety of entertainment can be found in Rehoboth Beach and Dewey Beach. 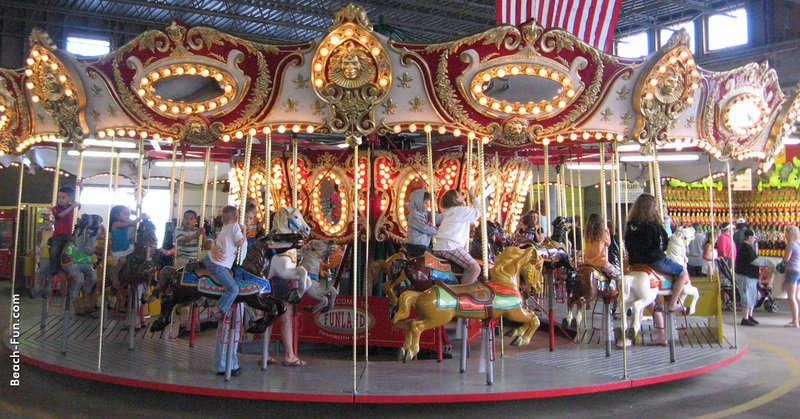 The amusements on the Boardwalk offer fun for everyone, particularly the young. 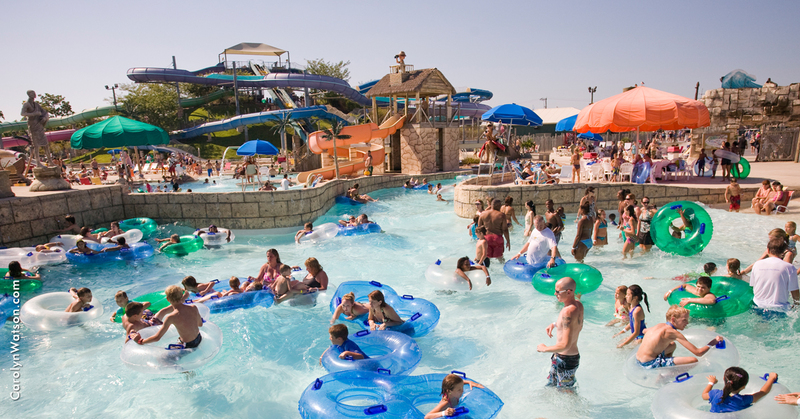 Throughout the area there are waterslides, go-carts and other sports activities for all ages. For night time activities, check the Restaurant section of the local newspapers for cocktail lounges and entertainment, and the Theater section for movie listings. Looking for a place to exercise for the day, week, summer season or whole year? Check out the options below! Garden Shack Farms - Beaver Dam Road (Rt. 23), Lewes. Thursdays, 2-6PM, April thru November. 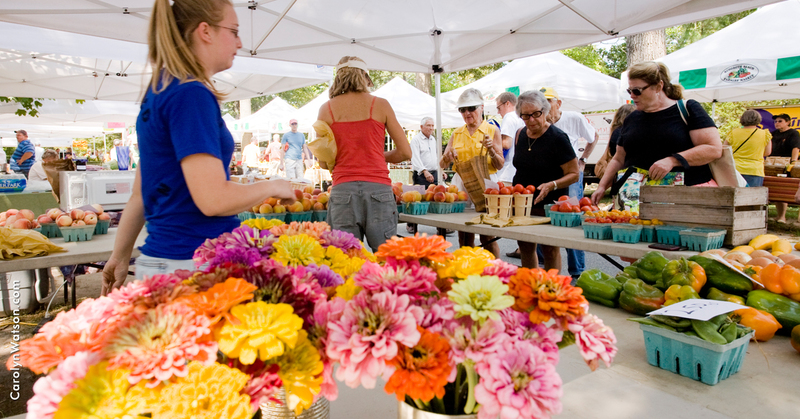 Rehoboth Beach Farmers Market - Grove Park, Rehoboth Beach. Tuesdays, Noon-3PM, May thru October. Whether in a car making a connection with New Jersey or on a walk-on round trip for the voyage itself, visitors to this area should take advantage of the opportunity to take a scenic trip across the wide mouth of the Delaware Bay. Also check out zoo and family fun cruises. Crossing takes about one hour and fifteen minutes one way. For information, call 1-800-64-FERRY or visit www.cmlf.com. We offer some of the best surf and deep sea fishing to be found along the East Coast. Fishing is also excellent in the Indian River Inlet area, Rehoboth Bay and Delaware Bay. Any bait and tackle shop will be happy to help you plan a fishing outing to suit your needs. A children's fishing bridge is a popular spot on Lake Gerar in downtown Rehoboth Beach. (Please note: The step-down Lake Gerar fishing pier is open year round and there is no charge to use). Division of Parks and Recreation Surf Fishing Beaches include Cape Henlopen State Park, Delaware Seashore State Park and Fenwick Island State Park. A fishing license is required in Delaware for those over 16. For additional information on fishing licensing or regulations, contact the DE Division of Fish and Wildlife at 302-739-9918 or visit www.fw.delaware.gov. For fishing locations, call 302-739-9914. You may also view/download general informtion regarding Fishing Licensing Information here. 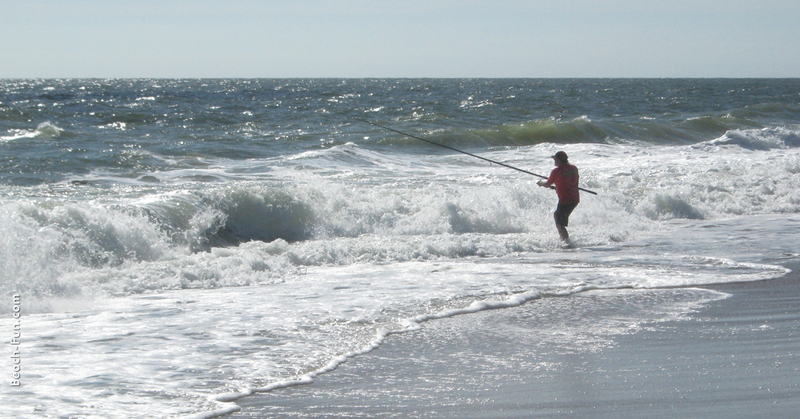 Also visit, www.Delaware-Surf-Fishing.com for additional information and updates. There is a four-wheel drive vehicular license requirement for all state-owned beaches. For more information call 302-739-9220. Tunas and tuna-like fish, billfish, and certain sharks are the speed champions, reaching 50 miles per hour in shorts bursts. Most strong swimmers speeds range from 5 to 10. 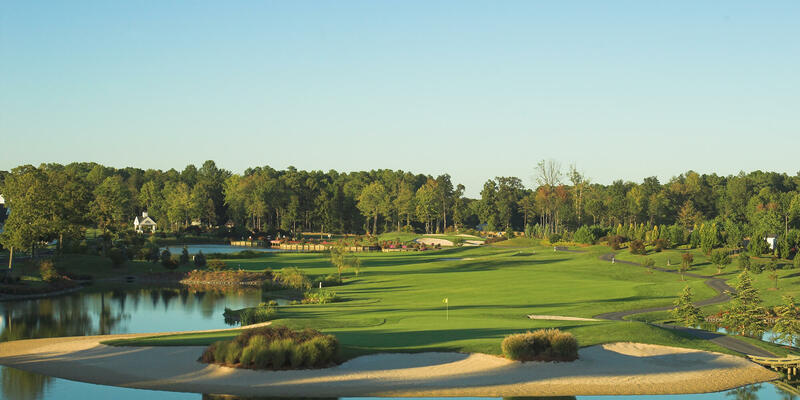 There are numerous public & private golf courses in Southern Delaware. REHOBOTH BEACH: Beach access ramps & platforms located at Philadelphia Street, Maryland Avenue, and at the Henlopen Hotel at the very north end of the Boardwalk. Persons with disabilities can enjoy accessibility to the beach through use of "beach wheels," wheel chairs which are designed specifically for beach use. Beach wheelchairs are available at the First Aid Station at Baltimore Avenue. Some beach chairs are available at the blue shacks at Maryland & Laurel Avenues off the Boardwalk. For more information contact City Hall at 302-227-2400. Handicapped restrooms are located at Baltimore Avenue, Rehoboth Beach. 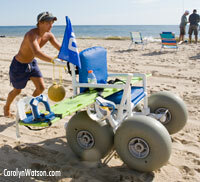 DEWEY BEACH: Handicapped beach chairs are available from the Dewey Beach lifeguards. To reserve a chair between May 15th-September 15th, call the Lifesaving Station at 302-227-6365. To reserve a chair between September 16th-May 14th, call Town Hall at 302-227-6363. Those persons driving vehicles with a valid handicap plate or permit are required to pay for parking meters and parking permits while the meters and permits are in effect. For more information call 302-227-6181. Regulated hunting is permitted throughout many parks and on several private tracts-acres of prime territory for waterfowl, deer, and small game. For information on hunting licensing, regulations or locations, contact the Delaware Division of Fish and Wildlife located at 89 Kings Highway Dover, DE 19901, 302-739-9910, www.fw.delaware.gov. Allowed on beach before 10:00 AM and after 5:00 PM on weekdays, after 5:30 PM on weekends. Indian River Marina at Delaware Seashore State Park - 302-227-3071 (click here) for information about bridge construction). Anna Hazzard Museum - 302-227-7310, 17 Christian Street in Rehoboth Beach. A Camp Meeting Era "Tent" structure housing artifacts and memorabilia. Call for information or appointment. Biggs Museum of American Art - 302-674-2111, 406 Federal Street, Dover, Delaware. Fine and decorative arts. Fort Miles WWII Museum - 302-645-6852, Cape Henlopen State Park, Lewes, Delaware. The Fort Miles Historical Association and Delaware State Parks are restoring Battery 519 to a world class museum. Fort Miles was built in 1941 to defend Delaware River and protect oil refineries and factories north to Wilmington and Philadelphia during World War II. It is home to big guns, including a 16-inch gun that was on the USS Missouri. Fort Miles is open year round for special events and tours. Programs require registration. Battery 519 is open Memorial Day to Labor Day Wed, Fri, & Sat for tours at 2pm for $5.00. Indian River Lifesaving Station Museum - 302-227-6991, Located on Route 1 near the Indian River Inlet, Rehoboth Beach, Delaware. The 1879 station was once home to members of the U.S. Lifesaving Service, later the Coast Guard, who kept watch for foundering ships. It has been refurbished to its 1905 appearance and is home to a museum, dedicated to the history of the local Coast Guard, and a gift shop. For the Delaware Seashore Preservation Foundation call 302-227-0478. Lightship Overfalls Maritime Museum - 302-644-8050, located in historic Lewes on the Lewes & Rehoboth Canal just north of the Savannah Road Bridge. Guided tours from Memorial to Columbus Day. Mon. & Thurs. - Sat. from 10AM-4PM & Sun. from 12-4PM. Groups tours available. Lorenzo Dow Martin House - 30 Christian Street. Built before 1848, the oldest house in Rehoboth. Now a part of Walls Apartments. Nanticoke Indian Museum - 302-945-7022, located at Routes 24 and 5, Oak Orchard Intersection, Millsboro. Native American library and artifacts. Rehoboth Art League - 302-227-8408, 12 Dodds Lane, Rehoboth Beach, Delaware. Just blocks from downtown Rehoboth! Explore an historic Sussex County treasure of colonial buildings and beautiful gardens. Our galleries have exquisite original works on display and for sale. Classes, events and more! Rehoboth Beach Museum - 302-227-7310, 511 Rehoboth Avenue, Rehoboth Beach, Delaware. Dive into our History! Come see exciting exhibits of vintage post cards & bathing suits, classic boardwalk rides & games. Learn about life at the beach in days of old. Donation only admission. Verrazzano Monument - When stolling along the Rehoboth Boardwalk, stop by the Verrazzano Monument located at Olive Avenua and the Boardwalk for a quick taste of our U.S. History. Honoring the Voyage of Italian Explorer Giovanni de Verrazzano, the first European explorer to chart portions of the east coast, the Verrazzano Monument was built in 2010 and sponsored by the Delaware Commission on Italian Heritage and Culture. Zwaanedael Museum- 302-645-1148, 102 Kings Highway, Lewes, Delaware. Replica of City Hall from Hoorn, Netherlands, which was dedicated in 1931 to commemorate the 300th anniversary of the first settlement in what is now Delaware. Seafaring artifacts, sunken treasure from the DeBraak. Hours: Tuesday-Saturday 10:00 A.M. - 4:30 P.M., Sunday 1:30 P.M. - 4:30 P.M., closed Monday and holidays. Admission is free. Also see History and Local Historical Societies. Dewey Beach Parasail at 877-FLY-DEWEY or 302-227-9507. Grove Park - Rehoboth Beach, Delaware located at the intersection of Columbia Avenue & Grove Street. Swings, slides, horseshoes, shuffleboard, restrooms, picnic area. Delaware Seashore State Park - 302-227-2800. The State of Delaware has major coastal areas reserved for public use, including the section south of Dewey Beach to Indian River Inlet. Just north of the Inlet there are usually surfers riding the waves. Limited year round, tent and RV. For Delaware State Parks (including Cape Henlopen State Park) reservations call 1-877-98-PARKS or visit www.destateparks.com. State Park entrance fees apply March 1 - November 30. NEW - Lifetime passes are now available to Delaware residents over the age of 65. Deauville Beach - Surf Ave, four tennis courts, open dawn to dusk, hourly charge, portable toilets. Delaware Seashore State Park - at the campground site on the south side of the Indian River Inlet (click here for information about bridge construction) - swings, sliding boards. Lake Gerar - behind the Henlopen Hotel. Tot Lot for ages 2 to 10. The step-down Lake Gerar fishing pier is open year round and there is no charge to use. Silver Lake & Stockley Street - slides, swings. 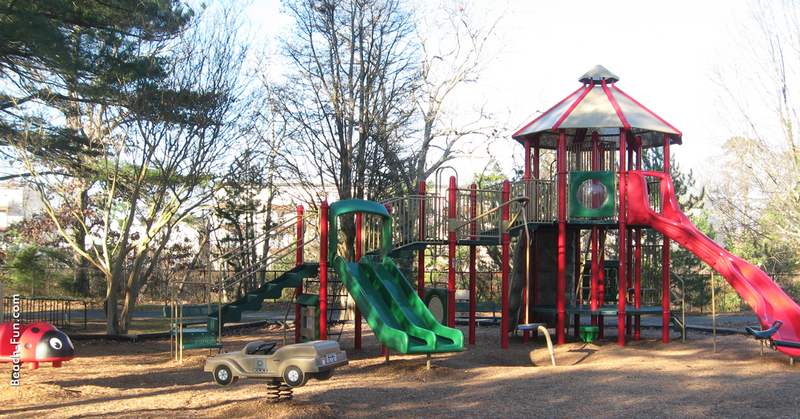 John Waples Memorial Lions Club park - on the bay side of McKinley Street - newly renovated with climbing equipment, swings, slides. Shields Elementary - Savannah Road. Cape May-Lewes Ferry Terminal - Lewes. The restored building located at 501 Rehoboth Avenue serves as the Rehoboth Beach-Dewey Beach Chamber of Commerce Office and Visitors Center. Maps, brochures and resort area information can be found on the exterior loading platform. City of Rehoboth parking passes (seasonal) can be purchased at the Visitors Center as well as area mementos. Ask staff to get the ceiling train rolling for you. Staff is available year round...call for hours. Quarters for the meters (seasonal) are also available at the Visitors Center. For more information, call 302-227-6446. Check out the Resort Area's only Rock Climbing Wall! Contact RISE Adventure + Fitness for details or call 302-567-2112. Located off of Coastal Highway/Rt. 1 at 35770 Airport Road, Rehoboth Beach. The Resort Area hosts numerous races, marathons and triathlons during the year. Visit the Chamber's Calendar of Events page for submitted individual race listings. Enjoy both small town unique & specialty shops plus factory outlets. Shopping areas are located in downtown Rehoboth Beach and Dewey Beach, and along Route One. All purchases in Delaware are TAX FREE. Plus, mark your calendars for the annual Resort Area Spring and Fall Sidewalk Sales! Enjoy a narrated tour of the beautiful resort community! Various options are available to "see" the area…on foot, by boat, by bus, or by trolley. Opportunities are offered by the following businesses: Cape Water Taxi, Delmarva Discovery Tours, Fisherman's Wharf, Jolly Trolley and Sun Otter Tours, LLC. Check out www.eumcrb.org/sk8 for information on the skating area at Epworth United Methodist Church in Rehoboth Beach. Contact Alley-Oop for skateboard lessons. Dewey Beach is host to several skim championships. For more info, visit www.skimusa.org. 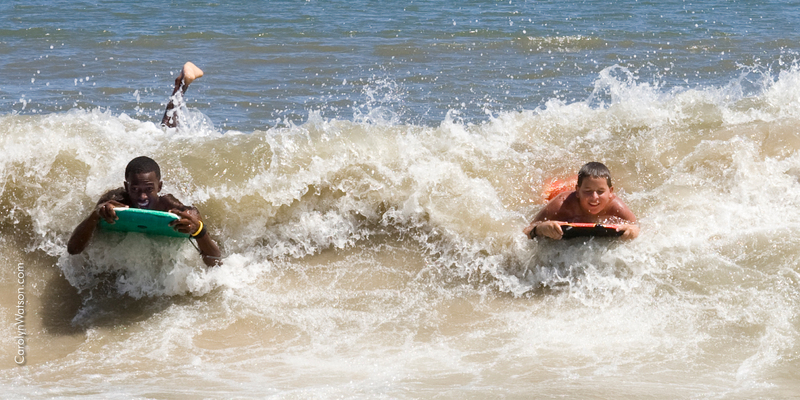 For skimboarding camps, lessons and retail, contact East of Maui Surf Shop - 302-227-4703. For lessons, contact Alley-Oop. 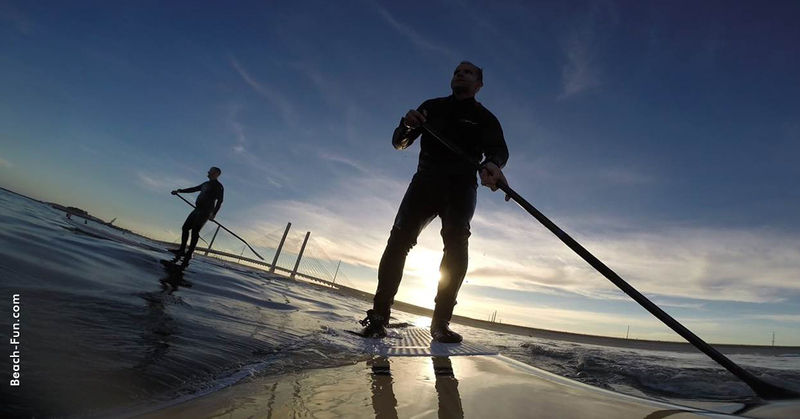 Surfboard riding is available on the Atlantic Ocean near Indian River Inlet on Route One, south of Dewey Beach. School/lessons for surfing available from East of Maui Surf Shop - 302-227-4703 and Alley-Oop - 302-227-7087. Ocean swimming can be found anywhere along our 30 miles of Delaware beaches. You will find patrolled beaches for your protection in Rehoboth Beach, Dewey Beach, Cape Henlopen State Park, Bethany Beach and portions of Delaware State Park. Also check out the FREE Monday Night Movies on Dewey Beach! Click here for times and movie schedule. Delmarva Discovery Tours - Offering private, local transportation services. Group and Private Local Tours such as Brewery / Winery / Distillery Tours. Types of tours: Antiquing Tours, Farm and Garden Tours, Beer, Wine and Spirits Tours, Wine & Garden Tours and Local History Tours using an 11 passenger van. Wedding Services such as Bachelor and Bachelorette Party Transportation). For more information, visit www.DelmarvaDiscoveryTours.com or call 302-260-9008. DART First State Resort Transit Bus Service – Resort-area bus service is available May through September, with most routes operating daily from 7 AM to 2 AM. DART provides service to the Long Neck area, Lewes along the Rt. 1 corridor, to the Outlets, into downtown Rehoboth, Dewey Beach, Bethany Beach, South Bethany Beach, Fenwick Island and Ocean City, MD. All buses are equipped with wheelchair lifts, bike racks, and are air conditioned for your comfort. DART offers two Park & Rides, one in Rehoboth located on Shuttle Road, just off of DE Route 1, north of Rehoboth Avenue. The parking rate is $10 per day and up to 4 occupants of the vehicle receive a free daily pass that is valid on all Resort Transit buses. A new Park & Ride is opening in May 2017 at the Lewes Transit Center further north on DE Route 1 nearby Five Points south of DE 9. The cost to ride the bus is a $2 per trip or $4.20 for a daily pass. DART’s Beach Bus, Rt. 305, provides bus service between Wilmington, Middletown, Dover and Rehoboth Beach on Friday nights, Saturdays, Sundays and holidays from Memorial Day weekend through Labor Day. DART also offers year-round bus service in Sussex County serving Lewes, Rehoboth, Georgetown (connections to Dover), Milton, Millsboro, Bridgeville, Seaford, Laurel and Milford. So, ride DART to explore these other areas and see everything that Southern Delaware has to offer. For more information, please visit DartFirstState.com or call 1-800-652-DART. Ride More. Save More. Do More. Jolly Trolley of Rehoboth - The Hastings’ family originally developed, and has been privately operating this direct coastal fixed route service between Rehoboth Beach and Dewey Beach since 1992, with no public subsidies! Leave your car parked, jump on a Jolly Trolley vehicle, and relax. It’s easy!!! This public carrier runs between Rehoboth and Dewey with stops throughout the area every thirty minutes or less depending on traffic daily, in season. Also available for special events, weddings and parties. The Jolly Trolley operates daily Memorial Day weekend through Labor Day Monday, 18 hours per day, from 8am-2am. Leaving each end of our fixed route on our BASIC SCHEDULE, during NON-PEAK travel times, every 30 minutes, :00 & :30 from Rehoboth Avenue and the Boardwalk in Rehoboth Beach, and at :15 & :45 from Dickinson St. in Dewey Beach on the Rehoboth Bay. During PEAK travel times, The Jolly Trolley arrives on a 5 -15 minute frequency. The Jolly Trolley fixed route service also operates weekend’s pre and post season as weather and demand dictates. Track The Jolly Trolleys on the fixed route in real time, get pre and post season schedule up-dates, plus view stops on a map by visiting www.jollytrolley.com, the Jolly Trolley Face book fan page or by calling the main office at 302-644-0400. Rideshare Delaware - Explore all of your commute options with DART’s RideShare Delaware Program. RideShare offers free carpooling and vanpool matching for commuters living, working or going to school in Delaware; vanpool formation assistance; transit commute information; and a free emergency ride home benefit to all those who share the ride or take transit using these ways. No car is required to join. Businesses who want to know more about supporting their employees’ commute can click here or call toll-free 1-888-Ride-Match (743-3628). Sun Otter Tours - The best way to experience the coast. Sun Otter Tours provides luxury minivan transportation and tours for 1-6 people. Larger group? No problem - the Sun Otter Bus can accommodate up to 18 people! Certified guides take you behind the scenes and beyond the usual to explore the coast in a whole new way. Check our regularly scheduled tours or enjoy a tailor-made itinerary for your group. Custom itineraries without the custom price. Find it all at www.SunOtter.com of call (302)519-3580. Best Bus Beach Bus - 202-332-2691. Begins its regular weekend upscale service between Washington DC's Dupont Circle and Union Station and New York City's Times Square and Rehoboth and Dewey Beaches on Friday May 22nd. Free bottled water and WiFi too! Visit www.bestbus.com for complete schedules and booking information! Jolly Trolley - 302-644-0400. Call for info on chauffeured cars, vans, buses for transport to airports, train stations, etc. The First State Webfooters Walking club, year round walking event (Year Round Walk) is held from January 15 through December 15. The start and finish point for the walk is at the Sussex Family YMCA (105 Church Street, Rehoboth Beach). For information call 302-945-2020 or 302-697-1191. The Rehoboth Beach Historical Society also has a Walking Tour that begins with the Anna Hazzard Museum located at 17 Christian Street, Rehoboth Beach. Call 302-227-7310 for more information. Dewey Beach Walking Tour...Explore the Town of Dewey Beach and discover some of it’s many treasures! There are two walking tours: Bayside & Oceanside. Click here to view the map. Visit our Wedding/Group Resources page. Nassau Valley Vineyards - 302-645-9463, located at 32165 Winery Way, Lewes. Delaware’s premier award winning winery. Open year round for tours & tastings. Monday-Saturday from 11AM–5PM. Sundays from Noon–5PM. Picnic tables on site. Fantastic location for weddings & private functions.